Mother Nature, what did you do? We are excited to welcome back Tara Harvey to the blog today. Tara is a Hydrogeologist with the Lake Simcoe Region Conservation Authority. Previously she told us all about why she was always standing in fields. For more about Tara, see the end of this post. Field work is fantastic! It’s a great opportunity to get out of the office, stretch your legs, and collect some data. And even when you are doing the same type of field work over and over and over again, Mother Nature can make things interesting when you least expect it. As a hydrogeologist (someone who studies geology and groundwater), the field work I tend to participate in is rather repetitive and might not be considered super exciting. I don’t get to go searching for animals in the wild, I don’t get to use fancy equipment, and I don’t typically get to travel to far off lands. What I do get to do is go out to construction sites, or other places where we are interested in monitoring groundwater quality or quantity, and either take a small sample or use a measuring tape to determine the water depth. Very exciting, right? Regardless, I do really love field work and have some pretty interesting stories, most of which are all thanks to good old Mother Nature. In the summer of 2017, I was up in Northern Ontario to do some groundwater sampling. Now, you can collect groundwater samples for many reasons, but the general goal is always to see what chemicals or contaminants are in the water. 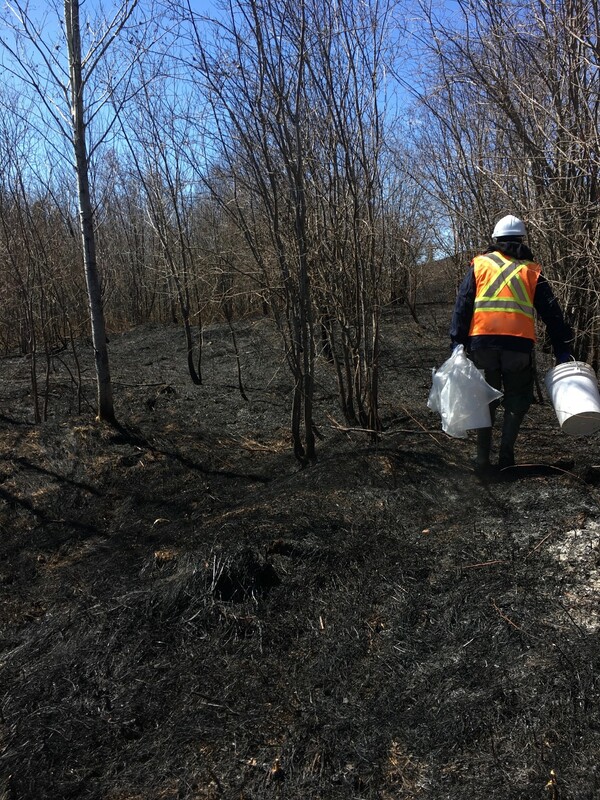 This time around we were interested in monitoring the movement of chemicals from an active industrial site to make sure there was no negative impact to the natural environment. But what should have been a very easy, mundane, and predictable field excursion turned out to be anything but. Of course, Mother Nature isn’t the only unknown force that can upset a tightly designed field schedule. Nope, you also have to account for the unpredictable behaviour of both the Canadian postal system and your teammates’ memories. Unfortunately for us, on this particular field adventure all three things went a little awry. Firstly, one of our team members forgot to ship some of the equipment we needed for the field work to the site. The delay could have been a problem – but ended up not mattering, since even the equipment that was shipped on time showed up several days late courtesy of Canada post. But the most interesting surprise was this…. In case you can’t tell from the photo, that is a completely burned forest! Yes, just the day before we arrived to get our groundwater samples, a forest fire burned through the area, destroying all the vegetation in its path. The fire had happened so recently that the Ministry of Natural Resources and Forestry were still conducting their investigation to determine whether it had been caused by natural or human forces. 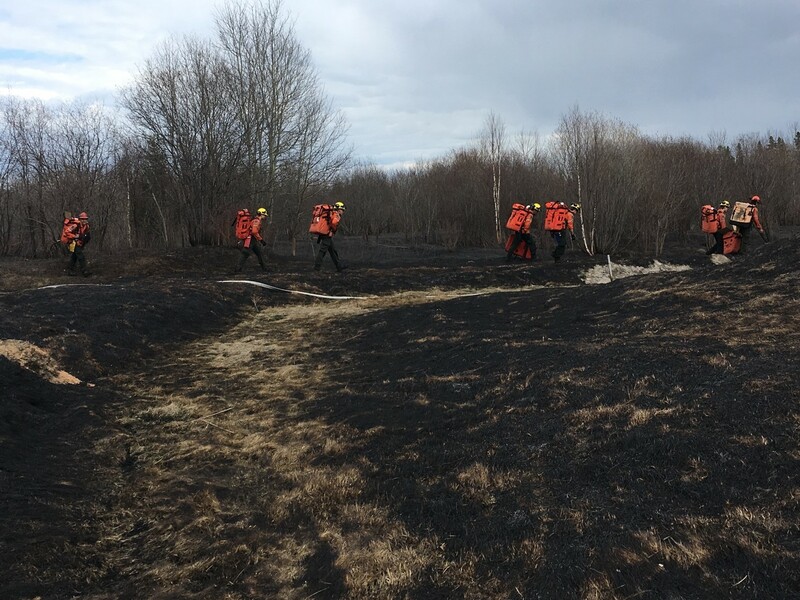 Either way, the fire was actually very confined and caused minimal damage beyond a very small section of burned forest. Even the trees weren’t badly affected, and should continue to grow in the future. Regardless of the limited damage, it was definitely an unexpected sight that we walked into on that first day. 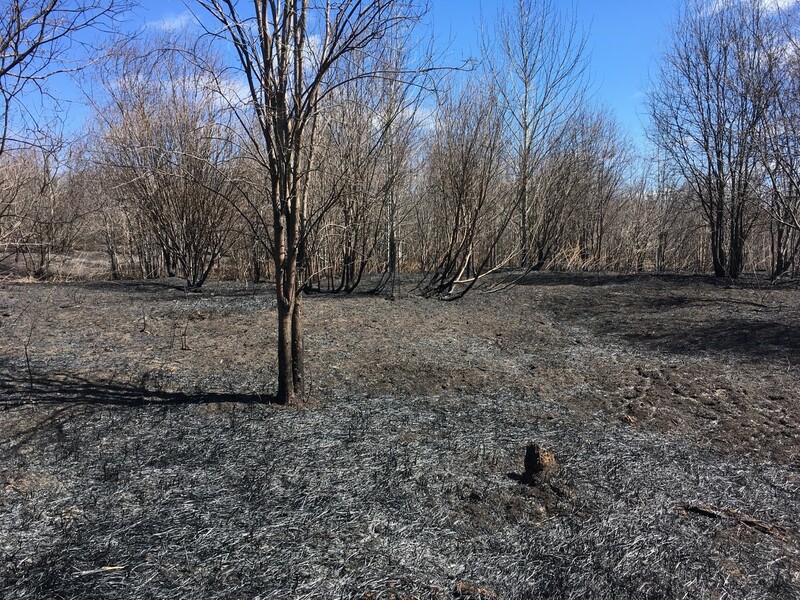 Immediately, we wondered what the fire meant for our groundwater wells, which are 2-inch plastic tubes that stick out of the ground and might have melted. Did they survive? Would we even be able to do any of our field work at all? Luckily, we soon found out that although the fire burned everything that was alive, all of the wells on site were perfectly fine since they had protective metal casings over top of them! Thankfully. If the plastic wells themselves had been exposed, this might have been a different story. Although the forest fire destruction was a surprise, it actually made our work easier in the end, since we didn’t have to fight against the vegetation to go find our wells in the ‘jungle’. And it definitely made for some interesting, if not beautiful, photos. The lesson I took away from this field excursion, and the lesson I always take away from field work, is to be prepared! You never know what is going to go wrong or what is going to surprise you, especially Mother Nature. T ara Harvey works as a Hydrogeologist with the Lake Simcoe Region Conservation Authority and has previous experience in research and consulting with the G360 Institute for Groundwater Research and Cole Engineering. 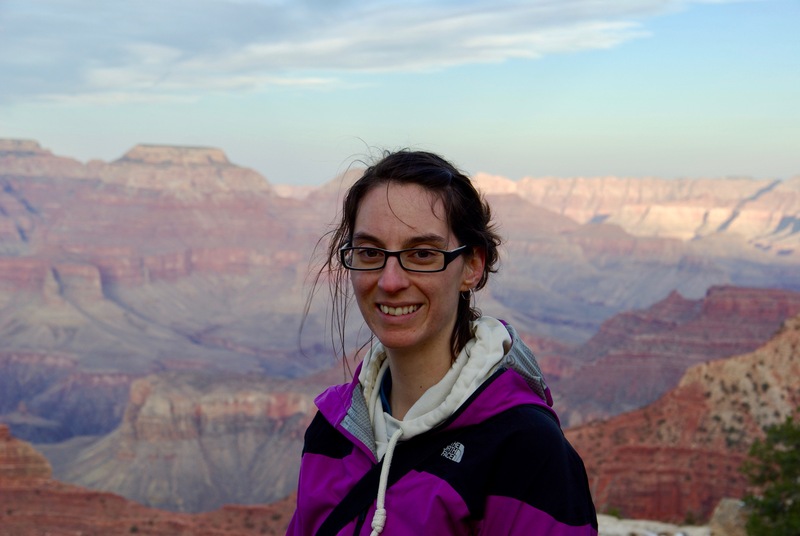 Tara specializes in Quaternary geology, aka glacial geology, but now spends much of her time working on Source Water Protection in Ontario to make sure our drinking water sources (lakes, rivers, and groundwater) stay protected. 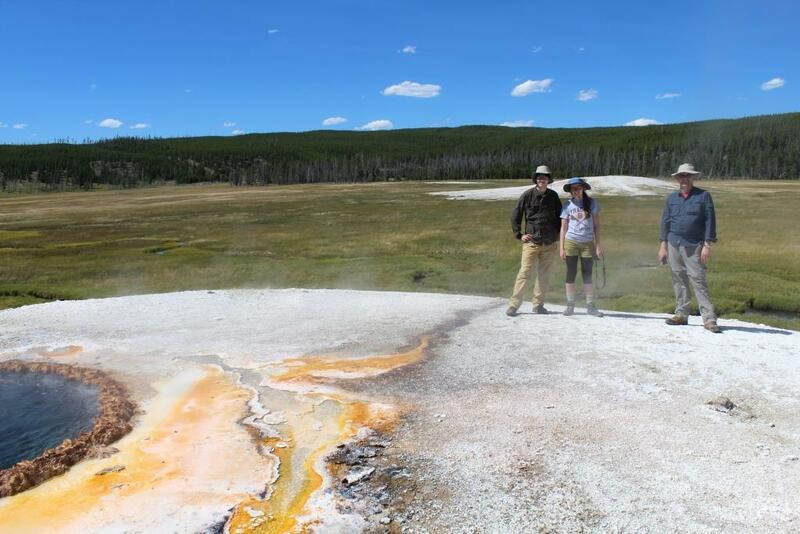 I am excited to file this report upon the end of our successful expedition to sample hot springs in Yellowstone National Park and then glacial systems on Pacific Northwest stratovolcanoes – or as I have dubbed it, our Fire and Ice Tour. Many thanks to Dispatches from the Field for being interested in hearing about our adventures. This was an ambitious trip for Professor Hamilton (my life collaborator) and me, which turned out to be a tremendous success, thanks in large part to the help of the other scientists on our teams. 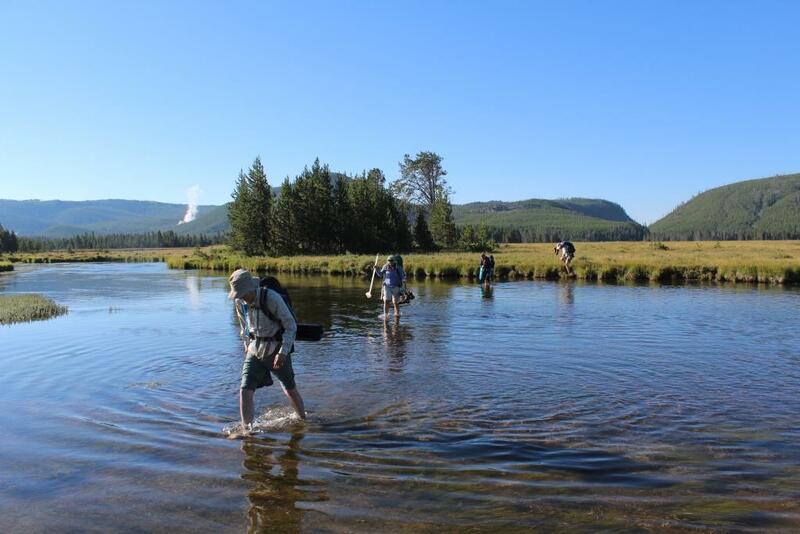 And please note, in order to sample in Yellowstone National Park, as well as in the National Forest Wilderness Areas, we had to undergo a rigorous permitting process. #TeamFire assembled at Madison Campground in Yellowstone National Park the afternoon of July 21st, setting up our base of operations. From there we would drive to the trailheads that would take us off the beaten path to sample hot springs in the back country of Yellowstone. Having learned from my experience as a graduate student in GEOPIG at Arizona State University, we brought a large tent that would house all of the science gear and equipment (the science tent). Being deep into Grizzly country, we of course kept all food items and toiletry kits in the cars. The mission of #TeamFire was to collect water, molecular, biofilm, and siliceous sinter samples from select hot springs, and to conduct carbon fixation experiments as parts of ongoing research being conducted by myself, Professor Hamilton, Professor Czaja, and Andrew. A sampling day consisted of waking up, getting water boiling for the crucial initial caffeination, eating breakfast, making lunch for the field, getting all of the needed science gear together, packing our packs with everything, loading the packs into the transport (aka minivan), and heading out. If all went well, we would be on our way by 9 am at the latest. We would then park at the trailhead, load our packs onto our backs, clip the bear spray to our belts, and head off to explore and sample hot springs that the general public never sees. Sentinel Meadows in the Lower Geyser Basin, setting up to sample the spring in the foreground (Rosette Geyser) on our first day in the field. One of my very favorite places in Yellowstone. In the background (from left to right) are the steaming sources of Flat Cone, Mound Spring, and Steep Cone. Field day one was spent in the Sentinel Meadows area of the Lower Geyser Basin. This is an area characterized by boiling hot springs (93°C at 8000 ft or 2500 m) with outflow channels that transition from chemotrophic to phototrophic. Almost all of the hot springs within Yellowstone are saturated with silica (from dissolution of the volcanic rocks by the deeply-circulating hydrothermal fluids), resulting in precipitation of siliceous sinter when the water cools. All was well until I came to the realization, as I unpacked my pack after our ~2 mile (~3.2 km) hike, that I had, in fact, left the pH meter and probe back at camp (there’s always something on the first day). After I had a very heated, albeit one-sided, exchange with my pack, Professor Czaja volunteered to hike back to the car and drive back to camp to retrieve the precious meter and probe, and rejoin us. As this is a fairly non-Grizzly-ish area (wide open prairie and long fields of vision), we decided this would be fine/safe, and Professor Czaja saved the day. Dinner: Burritos with refried black beans, three cheese blend, fresh salsa, and avocado. Part of the Yellowstone crew standing on Steep Cone in Sentinel Meadows, Lower Geyser Basin. From left to right: Andrew Gangadine (UC Geology graduate student), Annie Gangadine (Volunteer), and Professor Andy Czaja (UC Geology). Field day two was into the Obsidian Pool area of the Mud Volcano Area, necessitating a longer drive along the northern portion of the grand loop road. After waiting for a lone male Bison to leave the trail (while foolish tourists attempted to one-up each other in stupidity, approaching WELL within the 25 yard (23 m) perimeter advised by the park staff to photograph the Bison…but then, what do the park staff know about Bison? It’s not like they work and live with Bison year round…), we headed off for what would be a fine day of collecting samples. The Obsidian Pool area exhibits subsurface boiling, leading to the separation of the liquid phase from the vapor phase, which concentrates volatiles such as H2S in the steam that condenses from the vapor phase. When the H2S interacts with oxygenated water, the H2S is oxidized to H2SO4 (sulfuric acid), driving lower pH values in hot springs that are fed by condensed vapor phase fluids. Dinner: Grilled bratwurst with potatoes, sauerkraut and applesauce. Panorama of the Obsidian Pool Area, where we sampled on our second day in the field. Obsidian Pool (the non-descript pool in the middle of the image) is where the third domain of life (Archaea) was first characterized/discovered. 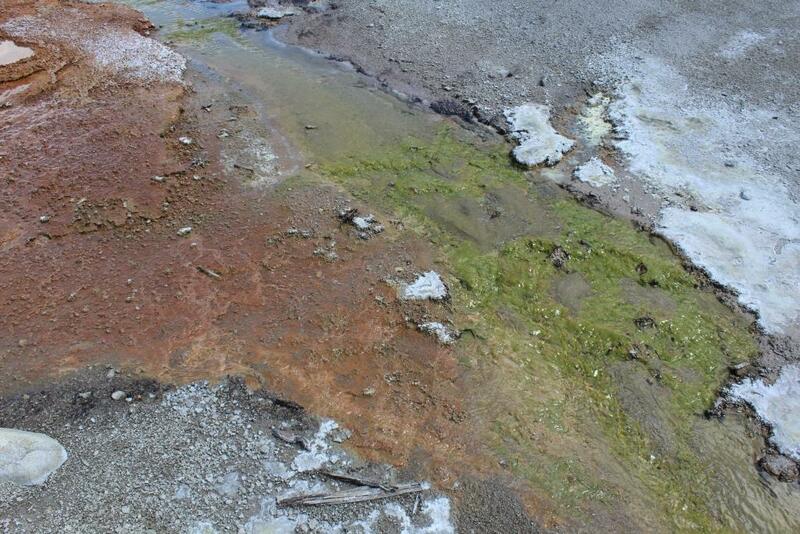 Many interesting microbial community morphologies can be found in the various pools in the area. Field day three took us into the Norris Geyser Basin, in an area called ‘The Gap’. The Norris Geyser Basin is one of the most dynamic hydrothermal areas in the park, where the intersection of large regional faults brings heat very close to the surface, driving intense subsurface boiling to generate very acidic conditions in places. Many interesting physical and geochemical gradients can be found in the mixing zones of hydrothermal systems. Here hot water from ‘The Gap’ (upper left) flows into a cool stream fed by acidic hot springs. Here our targets included an acidic spring we had sampled last year and had dubbed ‘Bun Warmer’ due to the very hot ground around it, and an extinct hot spring that had old layers of silica sinter exposed which we had dubbed ‘Has Been Hot Spring’. (Giving sites unofficial names assists in helping to remember and differentiate them, we have found. What’s easier to remember: ‘Bun Warmer’ vs. ‘Mellow Yellow’, or NGBHS007 vs NGBHS008?). Dinner: Chicken alfredo with bacon. Field day four was spent sampling at the Sylvan Springs Area, west of the Gibbon River in the Gibbon Meadow. Our approach was a 1 ½ mile (2.4 km) hike that started with a ford across the Gibbon River. Dipping our toes into that cool water was not an easy sell with temperatures close to 40°F (4.4°C), but man did it feel exquisite on the way out! Everyone stood in the water and let the river gravel act as a foot massage before hunger drove us the rest of the way to our transport. Sulfur crystals forming in a fumarole in the Sylvan Springs Area. 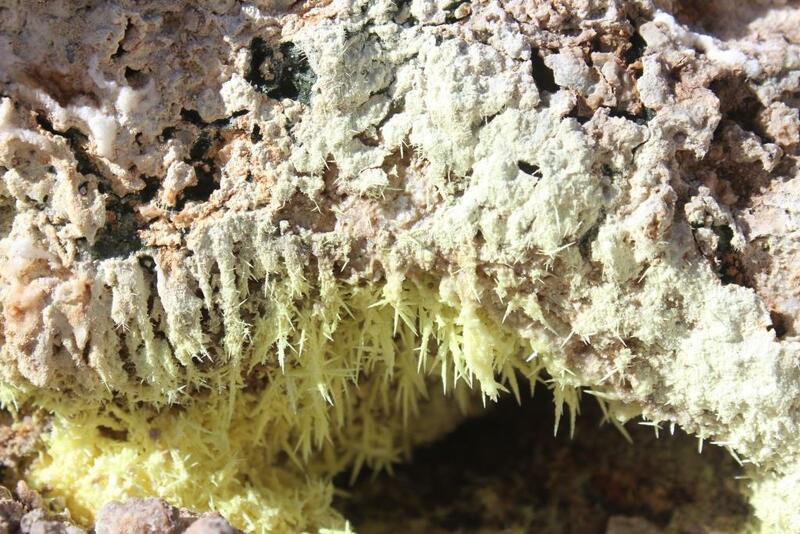 Note the dark green microbial community growing just above the sulfur crystals. Not surprisingly, sitting down in areas with lots of sulfur/acidic water can be detrimental to the integrity of the seat of your pants. The Sylvan Springs Area is another place where subsurface boiling allows vapor phase to dominate, with many fumaroles actively precipitating elemental sulfur. Sitting on the ground in areas like this is ill advised, as it often leads to a condition called ‘acid pants’: the sulfuric acid in the ground and water acts in a startlingly rapid manner to dissolve clothing, leading to individuals needing duct tape to patch the seats of their pants. Dinner: Pulled pork sandwiches with BBQ sauce and coleslaw. Sometimes sampling requires fording a river. Here the crew (left to right: Andrew Gangadine, Professor Trinity Hamilton (UC Biology), Annie Gangadine, and Professor Andy Czaja) follow me across the Gibbon River on our way to the Sylvan Springs Area. It was chilly in the morning, but man did that water feel good when we crossed in the evening. 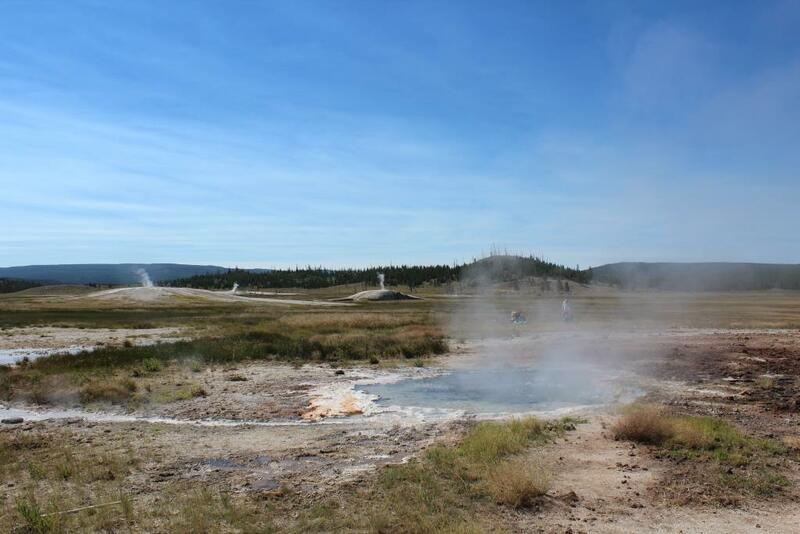 In the distance is (upper left) is steam from a thermal feature in the Geyser Creek Area. Field day five was only a half day, as we had to pack up camp. After packing everything and seeing Professor Czaja off (he was flying out that day from Bozeman, MT), we set off for the Rabbit Creek Area. Our approach took us through a large patch of extremely dense Lodgepole Pines that had seeded following the 1988 fires that had swept through the area. 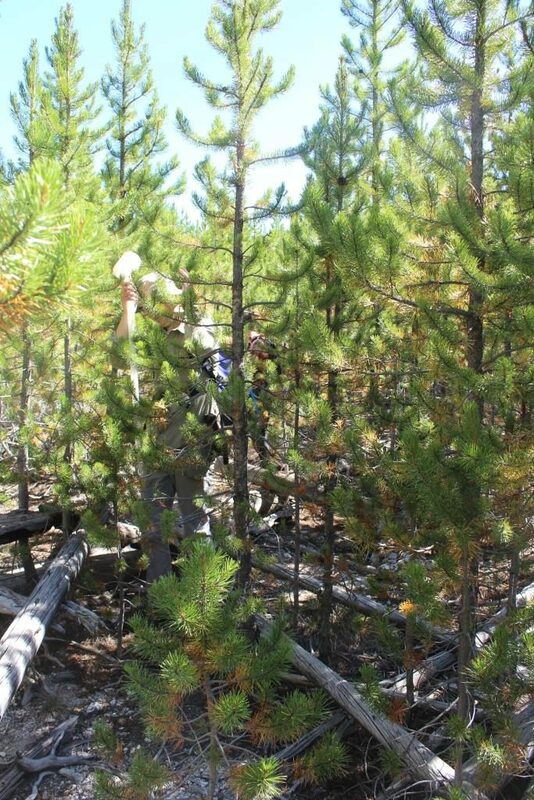 Following the 1988 fires that swept through large portions of Yellowstone National Park, Lodgepole Pine have reseeded and formed dense clumps that can be nearly impenetrable. Here the team pushes through a patch of what has been called the ‘green blizzard’. In some places it is so thick that you literally have to pull yourself through it. The crew maintained good morale through the worst of it, in spite of my leading them on a bit of a misdirect. Passing through these dense patches of often 20+ ft high (6+ m) Lodgepole Pine is an experience that we colloquially refer to as ‘the green blizzard’ – pulling yourself through the trees while being slapped in the face with branches of green needles, unable to see someone that is only feet away from you. The path I had selected was off the mark, requiring the crew to endure far more green blizzard than they should have, but they met it with good humor, for which I was extremely grateful. We finally made it to the Tomato Soup area, where multiple hot springs have a striking red hue (not due to iron, according to a colleague…so it remains a bit of a mystery…) Here we sampled from another extinct hot spring (‘Anatomy Lab’), as well as two active pools, before making our way back to our transport, and then off to Bozeman for a night in a hotel with a real bed and more importantly, a shower! The next day we dropped Andrew and Annie off at Bozeman International (with all of its six gates), and then stepped up to our next challenge: to make all of our camping gear and research equipment, which had filled most of a Toyota Sienna minivan, fit into a Nissan Versa Note subcompact car. Our reasoning was that we would save a lot of money renting a small car to drive from Bozeman, MT to Portland, OR (where we would then return the small car and pick up another minivan). Drawing on my only superhuman talent (packing), I was able to make it all fit while my life collaborator watched with a look of disbelief. This chapter closes, then, with us making our long drive to White Salmon, WA and then on the next day into Portland to pick up Jordyn Miller (graduate student at Purdue) and Helen Rogers (recently graduated B.S. from UC Biology working in Professor Hamilton’s lab) to start the Ice phase of the Fire and Ice Tour. Stay tuned for Part 2 with #TeamIce next week!